Like yesterday’s clash between Argentina and Colombia, this match up is the glamour tie of the group. Oscar Tabarez’s outside favourite Uruguay against Claudio Borghi’s ultra-attacking Chile side would hopefully light up the already interesting Group C.
Uruguay set up in the same 4-3-1-2 that they used against Peru, but with linkman Nicolas Lodeiro replaced by Porto’s less creative Alvaro Periera, although they sat deeper and looked to contain Chile, leaving the attacking to the trio up front. Chile also used broadly the same system as against Mexico, but with Mauricio Isla playing in a slightly deeper, more wing-back-esque role on the right and Luis Jimenez replacing Matias Fernandez as the “one” of the 3-4-1-2, sticking to their attacking pass-and-move game. The set-ups are all you really need to know, as the game followed a set pattern: Uruguay would sit deep and try to deal with Chile’s attacking pass-and-move style, while looking to hit the ball directly, or at least quickly, to the front three. There was little more to it, with few intricacies or glaring mistakes, but the quality of both teams ensured it was an interesting battle. Much like in the first game against Peru, and the World Cup last year, Edinson Cavani appeared somewhat wasted in his wider role. Luis Suarez clearly relishes his role leading the line, but he’s much more suited to a wide role than Cavani is, so it seems odd that Tabarez insists on playing them that way round, when Cavani looks so mediocre compared to the season just gone at Napoli, where he scored 33 goals in a number nine role. Although he’s not playing poorly, his withdrawal at half-time wasn’t all that surprising. On came midfielder Alvaro Gonzalez, signalling a change in formation for Uruguay. 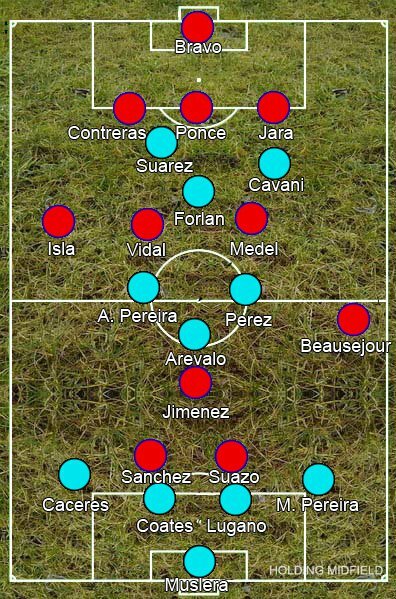 As expected, Gonzalez dropped into the midfield to create a 4-4-2 – although the withdrawal of a forward indicated a more defensive move, the extra cover meant Uruguay pressed Chile more. Well, at least until they went a goal up – afterwards the extra midfielder was a more defensive move. Uruguay’s goal came from a nice little through ball by Diego Forlan and nice play by Suarez, but more importantly some awful defending by Chile: Waldo Ponce deserting Alvaro Pereira presumably because he didn’t think Pablo Contreras could handle Suarez by himself – he was right of course, but it might not have been an issue if Ponce had stayed around Pereira. He didn’t and the Uruguayan was able to finish unopposed. There was nothing all that special for Chile’s equaliser. Alexis Sanchez dropped deep, a pass to Jean Beausejour wasn’t cut out, so his deeper run allowed him to get a shot away relatively unopposed, while the angle was a simple ball for Beausejour to play. The game continued to follow that same pattern until the final whistle, leaving us with plenty of unanswered questions. Chile have looked good, but, for all their attacking intent and attractive passing, they very rarely actually look dangerous, while Uruguay continue to look solid defensively, the odd issue aside, yet mediocre in attack.